Book: The Family Book by Todd Parr. I feel like librarians either love or hate Todd Parr and I love him. I love the colorful, silly illustrations and the welcoming and inclusive messages of his books (while they're still funny and engaging). The Family Book talks about all different kinds of families with the messages that all different families are okay and they all share love and help each other. Book: Baby Danced the Polka by Karen Beaumont, illustrated by Jennifer Plecas. This is a really fun rhyming book with a great rhythm. It begs to be read aloud! Baby won't settle down for his nap, preferring to dance away instead. Hearing rhyming words is great to help children hear that words are made up of smaller sounds. Song: If You Have a Brother... This is a song that I made up which follows the concept of If You're Wearing Red Today. And I repeat with different family members. Today we also did: sister, mommy, daddy, cousin... and then I asked the kids what other family members we could include. The first suggestion was "dog"! We also did cat (just me! ), grandpa, and grandma. This song is a great way for kids to share something about their family. It is also great for practicing listening and following directions. 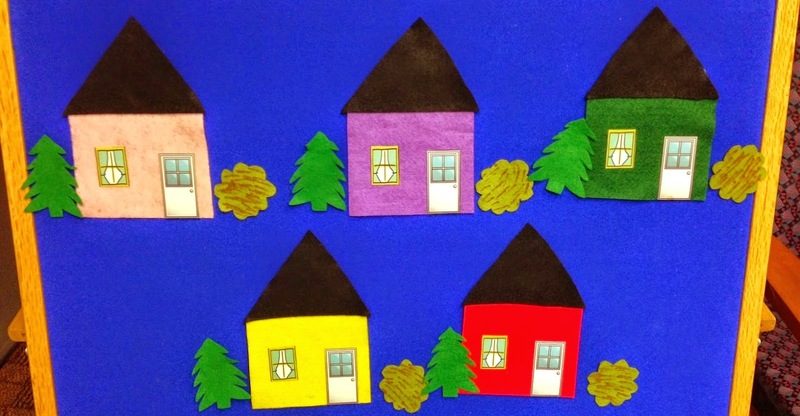 Felt Story: Mr. Pine's Purple House by Leonard Kessler. In this story, Mr. Pine tries to distinguish his house from his neighbors' but every idea he has is thwarted when his neighbor like them so much that they copy him! This is a great story for reinforcing the concept of same and different. We also talked about what kind of house (or apartment, etc.) our family lives in. Book: You Can Do It, Too! by Karen Baicker, illustrated by Ken Wilson-Max. This is a fun story about a big sister and a little brother. Everything big sister does, little brother wants to do, too. As I read this story, I asked the kids if they do some of these things, too - picking up their toys, brushing their teeth, going down the slide, etc. 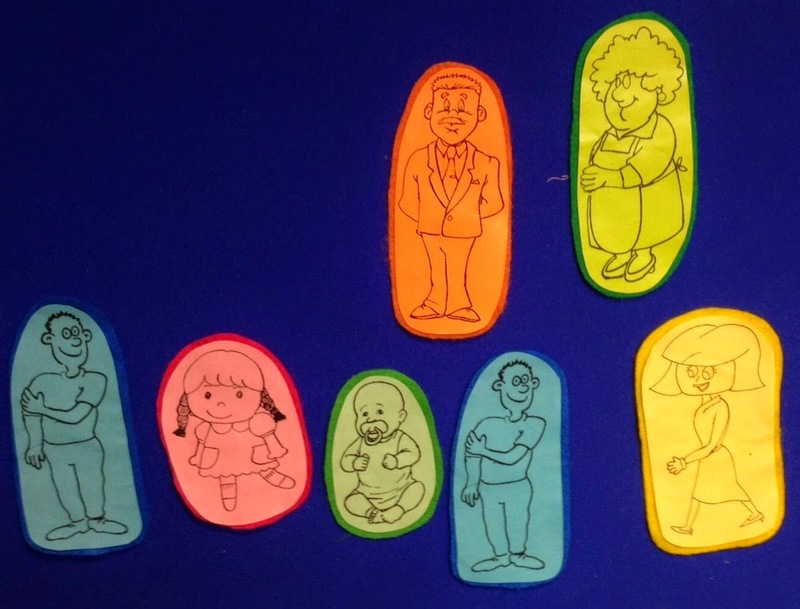 Felt Activity: Family members. I passed out a piece to each child and asked them to bring it to the board when I called the family member they had. After we have all the kids' pieces up there, we all count them together. This is good counting practice and - bonus! - helps me get a head count for my stats. 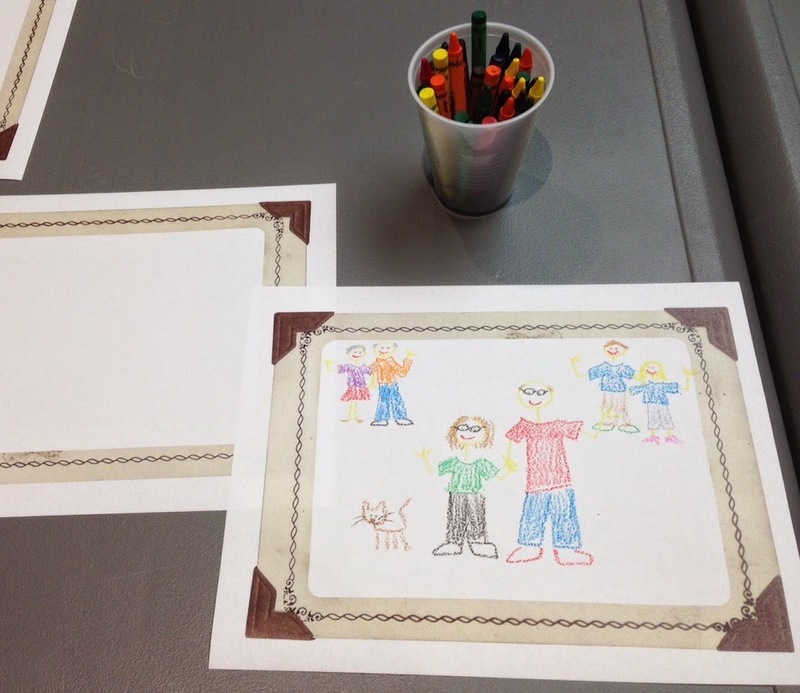 Family portrait craft. If you do a Google search for picture frame, you get lots of options and I printed some out and let the kids draw a picture of their families. This was a pretty popular activity and great writing or pre-writing practice for the kids. - Blocks with family play set. We have a set of family figures in one of our theme kits and I brought these out to play with the blocks. This was another popular activity with kids acting out different scenarios or building houses for their play families. - Floor puzzle. We also have a Richard Scarry house floor puzzle in our theme kit and I brought that out. A few kids worked together to put that together. 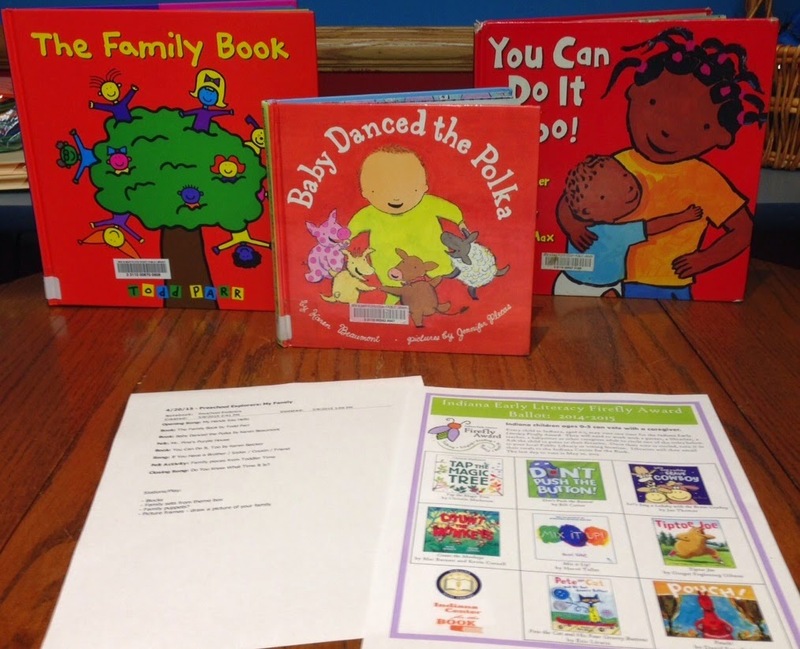 Mansfield/Richland County (OH) Public Library - I Love My Family!